St. Andrew’s Dawson Street is a Local Ecumenical Partnership (Methodist & United Reformed Churches) and meets in the Methodist Building in Dawson Street. This is a typical Methodist Church which holds about 200. 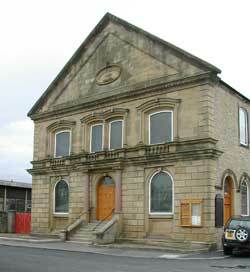 The premises, built in 1868, are Grade II* Listed. They have recently been refurbished and are now warm and bright and accessible to all. The services incorporate both Methodist and United Reformed features, with different styles of service, e.g. Café Style and All Age Worship. You will find a welcome here and we serve tea / coffee & biscuits after each service when there is a chance to chat to other people and catch up on Church Family news. Monday 2.00pm; Womens Own Meeting and Mother's Union - on the first Monday at St. Catherine's C of E and third Monday of the month at St. Andrew's. ‘Young in heart’ members who enjoy meeting each other and having a varied programme of speakers. The weekly meeting finishes with tea / coffee & biscuits and members also enjoy occasional outings for tea. 10.00am: Coffee Morning & Chat.This Coffee Morning is held on Crook Market Day and everyone is welcome to come. 7.15pm – 9.00pm: Mothers Club(2nd & 4th Tuesdays). A long running group of women who first met as young mothers. The group now extends over a wider age range. They enjoy a variety of speakers and demonstrations, have fun together, with refreshments at the close of the evening. 09.45 – 11.30am: Carers and Toddlers Group. For 0 – 2 year olds, during term time only. Cost £1.00 per child. 5.00 – 6.00pm: Rainbows (ages 5 – 7). 6.00 –7.30pm: Brownies (ages 7 – 10). 7.30 – 9.00pm: Guides (ages 10 – 14). These groups enjoy a wide ranging programme of fun and activities which aim to help develop life skills. For further information contact Mrs Christine Jackson : Tel. 01388 767643. 1st Friday of the month, immediately following school : The ‘C’ Club for crafts and cakes. All children and young people welcome, accompanied by an adult. The church premises are also used by various community groups and enquiries are always welcome from other groups wishing to use the premises. Rev Chris Humble (Methodist): Telephone 01388 766495 E mail Click Here. Rev Ray Anglesea (URC): Telephone 0191 3844402 E mail Click Here.